OTTAWA - China's government barred Canada's new ambassador from visiting Tibet as desperate monks prolong their wave of self-immolation to protest Beijing's rule over the Himalayan plateau region. The Canadian Press confirmed that Guy Saint-Jacques, the career diplomat who has also been Canada's climate-change negotiator, was denied permission by Beijing when he requested entry to Tibet. Saint-Jacques took up his new post last fall, after succeeding retired diplomat David Mulroney, who in October 2011 was the last Canadian diplomat to set foot in Tibet. "The Chinese haven't really allowed other diplomats to visit," said a senior official, who was not authorized to speak on the record about the issue. "Getting permission to travel to that area is subject to getting approval from the Chinese government to be allowed there." Lobsang Sangay, the political leader of the Tibetan government in exile, called on Chinese leaders to grant access to Canadian diplomats, an all-party committee of MPs as well as the government's new religious freedom ambassador. Sangay said that with reports of two more monks setting themselves on fire in recent days — bringing the self immolations to 107 since 2009 — international scrutiny of Tibet has never been more urgent. "I was told that efforts were made but so far the staff members of the Canadian embassy have not been able to visit Tibetan areas," Sangay told The Canadian Press after testifying before House of Commons human rights committee. 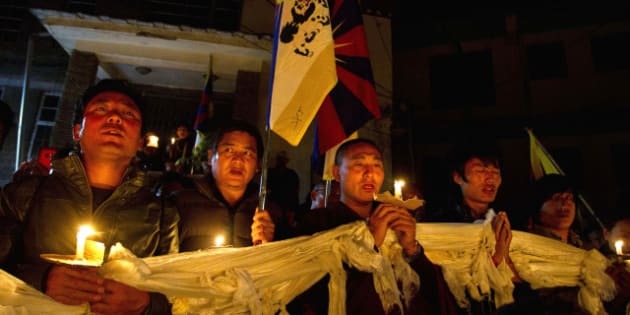 "The increasing cases of self immolations and the repressive policies of the Chinese government have unfortunately led to the sufferings of the Tibetan people." Sangay, a Harvard Law School graduate, succeeded the Dalai Lama two years ago as the political leader of the Tibetan people in exile. Sangay said that as Canada pushes deeper economic engagement with China, it should not give short shrift to human rights. "Canada's energy, China wants to buy it because it's cheaper here. If they get cheaper energy somewhere else, they'll go there and buy it," said Sangay. "It's important to have a business relationship, but human rights is equally important." Sangay was on Parliament Hill one day after the takeover of Calgary oil and gas producer Nexen by Chinese state-owned CNOOC was formally sealed. The $15.1-billion deal sparked controversy over how much foreign state-owned control of Canadian resources is acceptable. Doing business with a Chinese company raised some concerns because its owners are a non-democratic state. However, Canada does not have the capital necessary to develop its own resources, so overseas investment is needed. Prime Minister Stephen Harper's ultimate approval of the Nexen deal was widely opposed by some members of his cabinet and caucus, who support the Tibetan cause and find China's rights record distasteful. Sangay said he had a meeting planned with Immigration Minister Jason Kenney, who introduced the Dalai Lama in a glowing keynote address last year at a gathering of exiled Tibetan parliamentarians in Ottawa. Harper pushed to sell oilsands crude to China, and began a broader Asian economic tilt, after U.S. President Barack Obama postponed the approval of the Keystone XL pipeline from Alberta to the U.S. Gulf coast last year. Sangay came to Ottawa this week to highlight the human rights tragedy that is unfolding in parts of China that the world does not usually see. Tibet and neighbouring Chinese provinces where many Tibetans live are closed to the outside world. Independent confirmation of the growing wave of self-immolations is impossible. But Tibetan rights groups continue to document the tragedy, reporting the deaths of two men in their 20s in recent days, and the self immolation of two teenagers last week. Meanwhile, the Chinese clampdown on protests continues. Sangay said those who have chosen to light themselves on fire are doing it to send a message to the outside world. "Tibetans in Tibet are saying, 'Hear us, listen to us, and don't make our lives go in vain. Our cries and suffering are real; even though I am leaving this world, I'm doing it for the people who are left behind,'" he said. "That's a very sad way to give up their lives. Hence, it is very important for the international community, including Canada, to know what is happening inside Tibet, and then inform the Chinese government and the Canadian population." The Chinese embassy in Ottawa declined comment.